Healthy students make good learners. 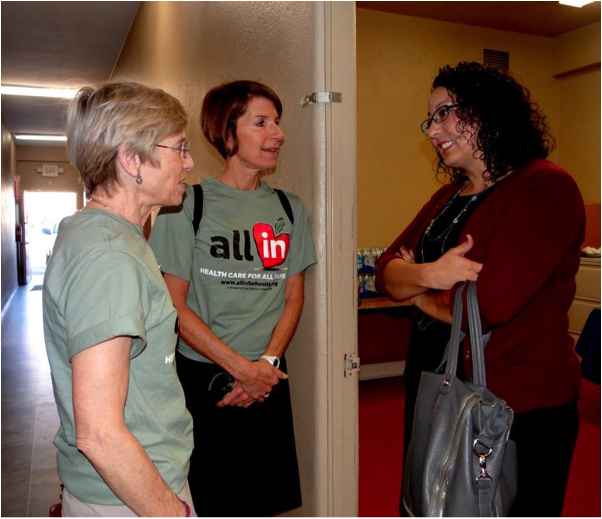 That’s the logic behind The Children’s Partnership’s ALL IN For Health Campaign, an effort to equip educators with the tools they need to connect children and families to health coverage and care. We’ve heard the impact of health on kids’ ability to learn from on-the-ground stories, including teachers who have seen students rack up absences and, as a result, fall behind in school. These are children who don’t get the health care they need or whose toothache or poor vision prevent them from concentrating in class. Many of these children don’t have health coverage and, thus, are not getting preventive or timely care when they have a health problem. Health coverage and care are key elements to making sure that students are in class and ready to learn. Students with health coverage are more likely to graduate from high school, go on to college, and contribute more in tax revenue as adults. The understanding that health is a key component to school success is now fueling a new federal initiative. Late last week, the US Department of Education (ED) and the US Department of Health and Human Services (HHS) announced Healthy Students, Promising Futures. This campaign offers schools a number of high-impact opportunities to improve the health of their students, from connecting eligible students to health coverage opportunities to promoting healthy practices through physical and health education. As a result of the Affordable Care Act, millions of children and adults now have health coverage. And now that students have that coverage, schools have the opportunity to move students up the wellness continuum, beyond the point of simply not being ill to being truly well. They can do this by connecting students to preventive care and educating them on healthy habits. ED and HHS recommend delivering health services to students directly in schools, providing support services and case management to at-risk students, and partnering with local hospitals and organizations. And, by promoting healthy habits such as eating well and engaging in physical activity, schools can encourage healthy habits that last a lifetime. At The Children’s Partnership, we share the Administration’s commitment and have acted on it through our ALL IN For Health Campaign. To reach as many families as possible, we’ve enlisted the leadership of the California State Superintendent of Public Instruction, Tom Torlakson, and partners like California School Boards Association, California Parent Teacher Association, and California Head Start Association, among many others, to help connect schools and early learning sites across California to the information and materials they need to help families understand their coverage options and help them enroll. As a result, we’ve been able to deliver over 7.3 million messages informing families about their health coverage options and how to enroll and connect to care. We applaud the Obama Administration for highlighting and supporting this high-yield connection between health and education and look forward to seeing what can happen when more schools and members of the health care community partner to help every student in the country thrive. If you’re a school or early learning center in California, use our toolkit to help eligible students and family members enroll in affordable health coverage. 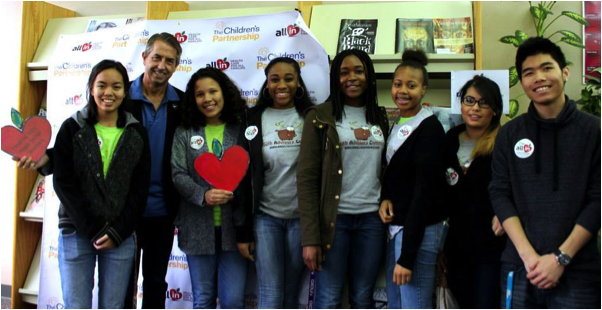 And learn more aboutThe Children’s Partnership’s experience in conducting a statewide campaign that partners health advocates and the education community in order to benefit the children and families they both serve. With less than two weeks to go before the February 15 Covered California Open Enrollment deadline, ALL IN For Health has ramped up its efforts to reach as many families as possible through schools, early learning and care, and after-school sites. On Saturday, January 24, we kicked off a 22-day statewide campaign to connect families to coverage. 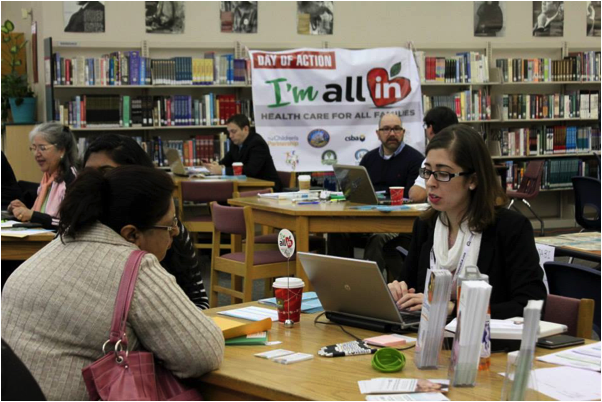 In partnership with Montebello and Natomas Unified School Districts, we hosted Day of Action health coverage information and enrollment events. 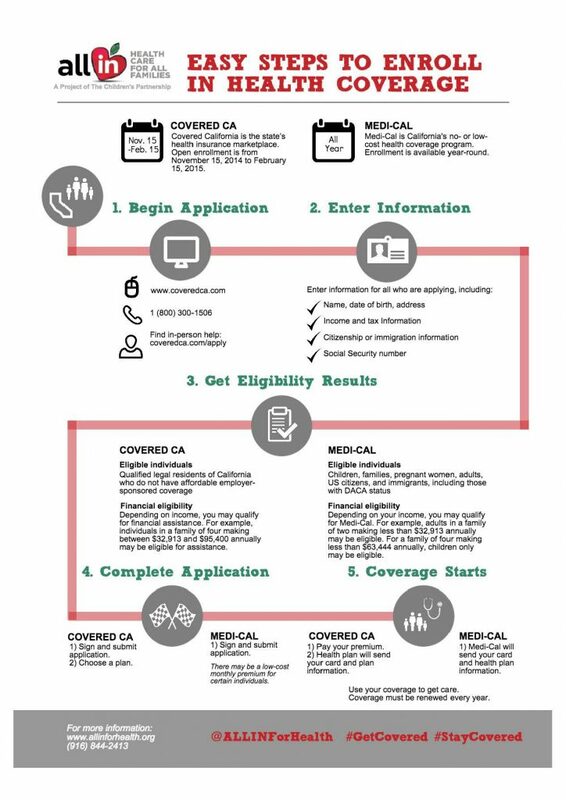 Over seventy families enrolled in affordable coverage with the help of Certified Enrollment Counselors and even more learned about their health coverage options through Covered California and Medi-Cal. Every family that enrolled helped grow the number of California kids who have the opportunities that a healthy upbringing affords. At Natomas High School, the Executive Director of Covered California, Peter Lee, stopped by to relay his enthusiasm that schools are spreading the word that health coverage is now within reach. In Montebello, local Assemblymember Cristina Garcia stopped by to show her commitment to expanding health coverage in her community. 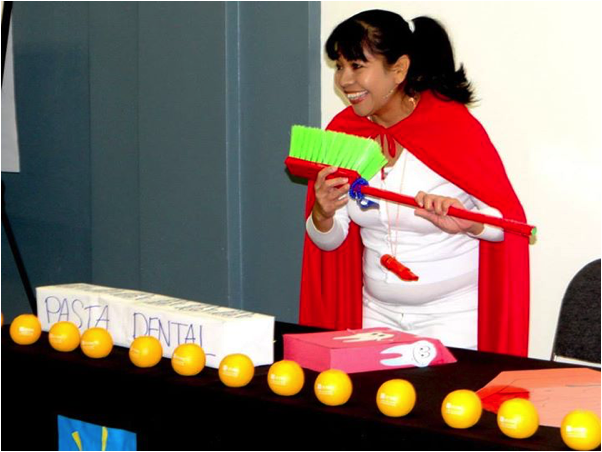 And our partners at LA Care presented lively educational skits on how to take advantage of health coverage. With the February 15 deadline fast approaching, now is the time to spread the word about applying for health coverage. 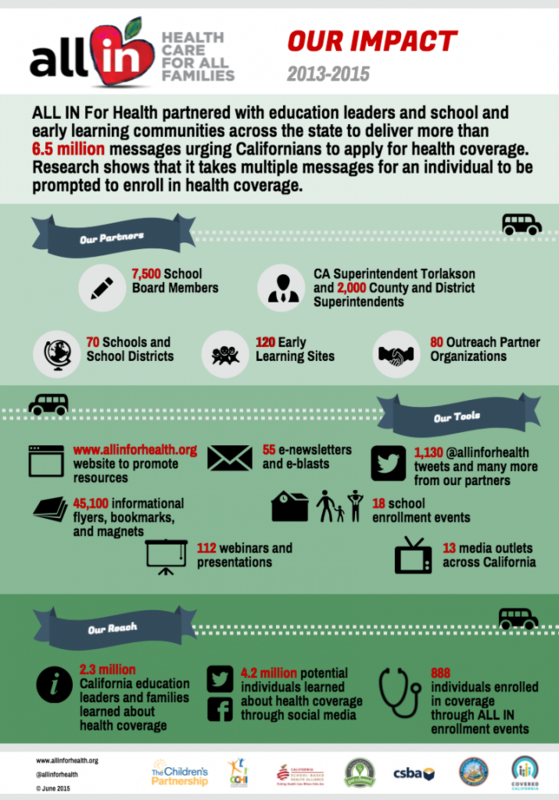 Schools across California know that healthy kids make better learners. That is why they are taking action for the health of their students by sending out eBlasts, making robocalls, and distributing enrollment information. And with several more events planned, you can even get out and learn more yourself with the help of Certified Enrollment Counselors. 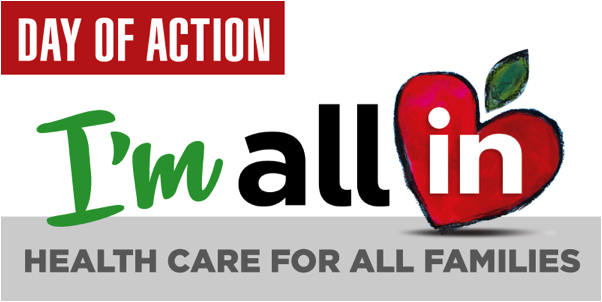 Learn more and get involved at http://www.allinforhealth.org/dayofaction.